In some ways, the greatest value of a garage sale is that it lets you clear out clutter and make a little money in the process. But there are some items that can help boost your profits, especially if you price them properly. Before your sale, check out some other sales in your area to get an idea of the prevailing prices. Costume jewelry. Costume jewelry appeals to a wide range of shoppers, from kids to hipsters to serious collectors. To get the best price, display your costume jewelry attractively. And price nicer pieces a little higher, so that you can negotiate. Re-giftable items. If you got a gift that was just not right for you – and if that gift is still in its original packaging – price it at about half the price of new and it should sell quickly. The buyer is likely to be someone looking for a gift that looks like it cost more than it actually did. Bags of clothes. The way to get the best price for clothes – and to get rid of it all – is to give shoppers a bag and let them fill it with whatever clothes they want for a set price. You can lower the price toward the end of the sale. Vinyl records. Music lovers say there is nothing like the sound of vinyl, and collectors often gobble up records. Just do a little research to make sure you are not selling your albums for much less than they are worth. Tools and toolboxes. These can attract both collectors and people who just enjoy fixing and making things themselves. If you price these right, they should sell early in your sale. Americana. Things like vintage metal signs and similar items recalling “the good old days” are very popular with collectors and with decorators. Bags or boxes of books. As is the case with clothes, it can be easier to sell books by the bundle. Try grouping books together – a box of mysteries, a bag of children’s books, for example. Old wooden furniture. Shabby chic is all the rage, which makes old wooden furniture that can be cleaned and spruced up much in demand. Be sure to price it to allow for some haggling. Old toys. Collectors love retro toys, and they know that yard sales are good places to get them. But if your old Barbie or GI Joe is in good shape – and especially if it is in the original packaging – you might get a better price if you sell it on eBay or at a collectibles shop. Kid clothes. Since babies and children outgrow their clothes so quickly, savvy shoppers know they can pick up bargains. Sell clean, gently used clothes priced at about 20 percent of the cost new. Antiques. If you can advertise your sale as including antiques, you will draw a larger crowd. But to make sure you are not short-changing yourself, check eBay or antique shops before you set your prices. Seasonal items. Put things like lawn chairs and kiddy pools in a prominent position if you are having a summer yard sale. 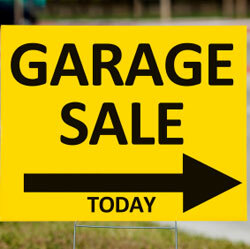 If your sale is in the fall, highlight rakes, leaf blowers and Halloween decorations. Bottled drinks. Shopping can be thirsty business, so fill a cooler with soft drinks and water, and sell them for $1 or more. It’s a quick and easy way to add to your profits.